What is Easy Rent Pro? Easy Rent Pro is an affordable multi-language car rental software designed for vehicle rental companies of all sizes and types. It is the world’s leading online car rental system that helps car rental businesses manage their daily operations, increasing efficiency and productivity. Easy Rent Pro has a Windows desktop edition which is ideal for auto rental businesses that operate in a single location. This standard edition can handle an unlimited number of vehicles and is loaded with rich features and tools such fleet utilization, quick lookup, rate management, and QuickBooks integration. The management of multi-location car rental operations is made easy using Easy Rent Pro’s cloud-based car rental solution. This online edition of the software allows vehicle rental companies to connect their workstations to a secure cloud server which employees around the world can access using the Internet. 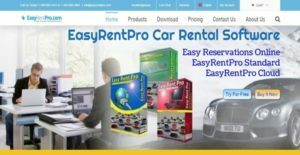 Easy Rent Pro also offers an online rental car booking system which permits clients to reserve vehicles through a website from their mobile devices or desktop computers. EasyRentPro Standard is the Windows desktop edition of Easy Rent Pro that is easy to use and available in different languages: English, Spanish, Dutch, French, Portuguese and Italian. As a multilingual car rental software, EasyRentPro can be used by car rental companies in countries across the world. However, this standard edition is suitable only for those car rental operations who are managing a single location. EasyRentPro offers enhanced features and tools that streamline the day-to-day operations of vehicle rental companies and businesses. One of these features is a rent planner that comes with a drag and drop functionality. The rent planner provides a quick view of all reservations and bookings within a period of 15 days. These reservations and bookings are color-coded so users can easily access and track information. If they want to view all their vehicles, reservations, and bookings on one screen, they can use the zooming feature of the rent planner. The drag and drop functionality of the rent planner makes changing of rental duration and vehicles a breeze. In addition, it allows users to sort and filter vehicles according to class, location, and more. Pieces of information that serve as reminders can be included in each vehicle like inspection date and insurance expiration date. Quick lookup is another feature available in Easy Rent Pro’s standard edition. This feature allows users to quickly view the number of their vehicles that are available, on rent, and those that are about to arrive. It also permits them to search for agreements and print them, as well as to check in and check out vehicles. They can generate vehicle utilization reports using the quick lookup feature. With EasyRentPro, users can easily prepare agreements. It has a rental booking form which lets them enter all the information and details needed for an agreement. They can also take advantage of its scan module which enables them to scan supporting documents for a particular agreement. For each agreement, the module allows them to scan a maximum of 3 documents. Monitoring and managing car rental operations online is made possible using Easy Rent Pro’s online Windows-based car rental software. This is another edition of Easy Rent Pro which is designed for multi-location car rental companies. This online car rental rental system stores data on a secure cloud server; and by simply connecting to the Internet, users can access this server. Supporting an unlimited number of vehicles and multiple locations, this edition called EasyRentPro Cloud connects multiple workstations worldwide, equipping them with data in real time. Easy Rent Pro has an online reservation system which permits clients to search and select available vehicles online, and reserve them using their mobile devices or desktop computers. This powerful online car rental reservation system offers a website that clients can visit to immediately view information such as vehicle availability, rates, and booking confirmation. The system can also be linked or incorporated into an existing website. It can be integrated directly to any edition of Easy Rent Pro: EasyRentPro Standard and EasyRentPro Cloud. The online car rental reservation system delivers sophisticated and flexible rate options. For instance, customers can enter details such as GPS, child seat, additional driver; and the system instantly calculates and displays the amount they have to pay. Users can also access taxes and surcharges, as well as apply season rates. In addition, the system provides users with content management features. Thus, they will be able to modify the rates for vehicle categories, add new vehicles for customers to select from, display promotions, and create online news. If you are considering Easy Rent Pro it may also be beneficial to check out other subcategories of Best Car Rental Software collected in our base of B2B software reviews. There are popular and widely used systems in each software group. But are they necessarily the best fit for your organization’s specific wants? A market-leading software product may have thousands of subscribers, but does it provide what you need? For this reason, do not blindly invest in popular systems. Read at least a few Easy Rent Pro reviews and think about the factors that you wish to have in the software such as the price, main features, available integrations etc. Then, shortlist a few solutions that fit your needs. Check out the free trials of these apps, read online reviews, get clarifications from the vendor, and do your research meticulously. This profound groundwork is certain to aid you choose the most excellent software application for your firm’s specific wants. How Much Does Easy Rent Pro Cost? We realize that when you make a decision to buy Car Rental Software it’s important not only to see how experts evaluate it in their reviews, but also to find out if the real people and companies that buy it are actually satisfied with the product. That’s why we’ve created our behavior-based Customer Satisfaction Algorithm™ that gathers customer reviews, comments and Easy Rent Pro reviews across a wide range of social media sites. The data is then presented in an easy to digest form showing how many people had positive and negative experience with Easy Rent Pro. With that information at hand you should be equipped to make an informed buying decision that you won’t regret. What are Easy Rent Pro pricing details? What integrations are available for Easy Rent Pro? Easy Rent Pro supports website integration. It can also be directly integrated with QuickBooks. If you need more information about Easy Rent Pro or you simply have a question let us know what you need and we’ll forward your request directly to the vendor.